Tony's Roofcare Inc. has offered residents and business owners in Pierce and south King counties with unparalleled roof repair for the last 20+ years. Our top-level customer service, high-quality products and experienced roofers add up to a winning combination when it comes to getting the best care for your roof. Perhaps you’re starting to see curling shingles or water damage on the ceilings. Whatever the issue, our competent team members will consult with you to determine the best course of action. Regardless of scope, Tony's Roofcare Inc. can fix your roofing issues with speed and professionalism. Stop worrying about them, and definitely don’t try to tend to them yourself. Let our experts solve the problems and provide you with peace of mind. We’ve spent years working on both homes and businesses in the region, and we can help you figure out which options will work best for your unique situation. Don’t ignore even minimal roof repair needs, or you’ll end up spending even more money and having to deal with bigger hassles down the line! If a storm passes through and you see shingles lying in your yard or your roof starts to leak, call Tony's Roofcare Inc. immediately. If you wait, both the interior and exterior of your property could quickly sustain costly damage. If a fire occurs or a tree falls on your roof, evacuate the building and wait for our team to inspect the damage. Don’t attempt to climb on your roof yourself. Let our team assess any damage and get to work on the repairs right away. 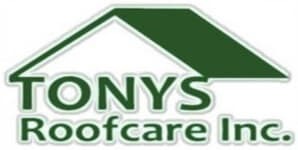 Contact Tony's Roofcare Inc. to get started with a free roof inspection and estimate. Reach out to us at (253) 841-7779 or submit our online contact request form.